• Budgetary allocation of 126% y-o-y is highest across all infrastructure segments. • Plans for over Rs 5 trillion investment in highways by 2019. The traffic piling up on the Highways prompted NHAI to introduce the RFID based FASTag. But the implementation has been facing many challenges and this has inspired NHAI to look at a possible alternative which could not only be an answer to the challenges imposed but also co-exist, thereby not make the investments made till date redundant. The EOI floated for alternative technology in the month of Sep 2017, received 33 submissions, out of which an ingenious Bluetooth based E-Toll system called Toll^ ( Toll Power ) stood out. Toll^ is both non-internet dependent & unobtrusive. This solution was piloted between Madurai and Kanyakumari with encouraging results. The average time for transaction stood at 5-6 Seconds, ideally the vehicle is not required to stop at the Toll Plazas . The App once downloaded in the mobile works in the back-end and hence allowing user to continue using the mobile in all possible ways. This technology also reportedly is less capex intensive compared to the existing Electronic Toll Collection methodology and promises toll Concessionaires remittance of t+1 day. The ease of adoption of this methodology for both toll concessionaires and users makes toll^ a more attractive alternative technology. All that toll concessionaires need to do is to power on the device provided by AppRaam and connect its validating controls like Boom gate, ANPR , signal, and AVCS ( Pre transaction). Toll^ can be easily integrated with existing IT infrastructure at the plaza level and hence no new investments required for this adoption. On the user side, the user needs to download the app and register, within six hours of completing formalities the user is ready for the trip. The App has a trip planning module which helps user estimate the exact toll charges and load just that to the wallet. Toll^ has scalable options to accommodate future requirements like, E-way bill, distance based tolling, traffic surveys and lot more. 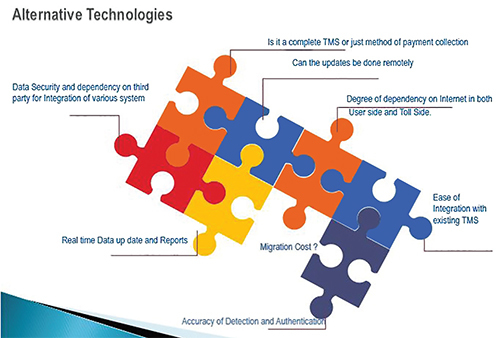 Toll^ is the brain child of Bangalore based AppRaam Labs , an IoT based software products company. They also plan to combine Toll^ with various amenities and make the Highway travel more comfortable. Muraleemohan M: Non-payment of toll is currently not an offence in our country. So that is one of the concerns. When it comes to electronic tolling, it is slightly going to get enhanced because we are certainly looking at gantry-based tolling, where there is a trust element that goes in and the system assumes a high level of compliance from users backed by strong laws discouraging violations. When Nexco, Japan’s largest expressway operator was asked what happens if a truck is running with a car’s tag, he replied ‘why would the truck run with a car’s tag, such a scenario does not exist in Japan at all’. We…are different. The concessionaires have always made this point that if the architecture assures that every single vehicle which is crossing the plaza will pay the toll somehow or the other on T+1 or T+2, there will be no qualms in opening up all the boom barriers. But the law should work.